The new country of South Sudan is blessed with oil, water, and a safari bonanza: one of the largest, most stunning animal migrations on earth. But without roads, laws, or infrastructure, can Africa’s youngest state turn potential into stabilizing profit? DAY ONE is Thursday, and we roll out of Juba, South Sudan, in the ambassador’s official ride, a Toyota Land Cruiser in spotless white. The driver’s door is showered with gold stars across a familiar sky blue flag and the words L’UNION EUROPÉENNE, the heraldry of someone who matters in this vast, imperiled infant of a nation. The someone is Sven Kuhn von Burgsdorff, a lean, 55-year-old German, and ambassador, who is not the German ambassador. Sven actually holds an obscure but equivalent title, commissioner, and represents the European Union as a whole. That makes him a kind of supranational diplomat for 27 nations, with a major say in the spending of $395 million in European aid to South Sudan over the next two years. A former commando, he once toughened his feet by running barefoot in the snows of Lower Saxony and jumps out of airplanes to relax. I personally will hear him speak five languages before this trip is over. Also in the Land Cruiser are Italian photographer Marco Di Lauro and Sven’s son David, a bushy-headed 26-year-old surfer and International Medical Corps programs officer already hardened by years of rolling around Africa chasing big waves. The ambassador has a paraglider in the back of the Land Cruiser, crammed in with camping gear, food, and bottled water. We are headed out of the dismal capital, driving south for four hours toward the Imatong Mountains, where we hope to find and summit Mount Kinyeti, at 10,456 feet the highest peak in the country. The ambassador wants to tour the south of South Sudan, get some exercise, and then fling himself off the peak in his paraglider, avoiding a crash landing in the Central African jungles while claiming some fun distinction like First Unpowered Descent from a Place No One Has Heard Of. The only problem as we leave town late Thursday: von Burgsdorff mentions that he has to be back in Juba on Sunday afternoon, which leaves us just Friday and Saturday to make a hike that should take three days. But what are schedules out here? Only 15 minutes outside Juba we’re held up by a potential land mine, one of untold numbers believed to be scattered around South Sudan after the 22 years of civil war that led to its independence from Sudan. A cluster of cars is pulled to the side, the passengers sitting under a tree, and down the road are a pair of armored bull-dozers operated by remote control. Ambassador Sven spends the break speed-reading a thick report on a typical messy dilemma in South Sudan: how to join the International Criminal Court without destroying relations with the nation’s neighbor and former overlord, Sudanese president Omar al-Bashir, an indicted war criminal who holds the key to negotiating an oil deal. Sven makes neat marks in the margins and then fires up his satellite phone. With the thoughtless ease of a Type A übermensch, he rocks four of his five languages in a couple of minutes: French with a colleague, English when reading back text, German to his son, and then, calling out the window to ask about the land mine, some Juba Arabic, a common dialect among soldiers and policemen here. The robot bulldozers soon flatten whatever it is they’ve uncovered. There is no explosion. The road opens, and we start crawling forward again. THE NEWEST country in the world is physically large—240,000 square miles, the size of France—and catastrophically ungoverned. It is a featureless grassland for most of its open, landlocked run. South Sudan is a landscape without clear divisions or functioning borders, touching Sudan and the Arab world to the north and the troubled Democratic Republic of the Congo and Central African Republic to the west, with East Africa pressing up from below. The waters of the Nile and thick seasonal rains drive a wedge of green grass across plains teeming with animals. National Geographic explorer Mike Fay made global headlines in 2007 when he completed the first aerial survey in 25 years and estimated that there were 1.3 million animals flowing across it, a great migratory river of white-eared kob and other antelope and gazelle dotted with a stash of elephants and a handful of species—including beisa oryx and Nile lechwe antelope—existing nowhere else on earth. Finding this many unknown animals anywhere was like finding El Dorado, Fay said at the time; finding them in war-torn Africa was even better. Though no one has counted in decades, there might be ten million people, too. South Sudan is quilted internally by some 60 tribes, many of them nomadic herders with long-standing antagonisms. But a year before my visit, on July 9, 2011, the Dinka, Nuer, Bari, Azande, and dozens of others came together to declare independence and raise the tricolor flag—black, red, and green—of a new nation. The president, a Dinka and former military officer named Salva Kiir, favors black cowboy hats and lives in hotels. A disorganized parliament struggles to create a host of new ministries out of empty buildings, and the National Archives are a pile of crumbling documents on the floor of a tent. Independence has added innumerable corrupt factions, including newly enriched local businessmen from the Tribe of Hummers. South Sudan is not a society in recovery: there never was any real infrastructure, government, civil society, rules, laws, or rule of law here, so there is nothing to recover. Instead it’s a scratch country, invented as a solution to an insoluble problem of semipermanent war and defined by what it lacks. There is no electrical grid, no mail service, almost no roads even of the dirt kind, and perhaps a few hundred miles of asphalt if you count every paved block in Juba. The have-nots have a lot of not: barely a smidgen of schools, almost no health care, a population living on zero dollars per day in a subsistence-farming economy where cattle are traded like currency. There are more guns than people who can read; refugee camps are more common than towns; snow would be easier to find than a road sign. South Sudan was carved from the much larger, Arab-dominated country of Sudan, the last in a series of remote governments, from ancient Egypt through the Ottoman Empire, which viewed the south chiefly as a source of converts or slaves. In the 19th century, British explorers traced the routes of the Blue and White Niles but left little impression on the land and evacuated in 1956, leaving the northerners—typically pale-skinned Arabs from Sudan’s capital, Khartoum—in charge. The vast open spaces became a kind of formless border between the Middle East and Africa, with Muslims in the north and black Africans, often Christian or animist, in the south. When people talk about the war here, they have several to choose from. They might mean the anti-British struggle of the 1950s or the coups and countercoups of the 1970s, but they probably mean the south-versus-north war that broke out in 1983 and lasted 22 years. In general, all the wars have pitted central authority in Khartoum against the margins, including the Darfur genocide that began in 2003 in Sudan’s far west. The war in the south featured the same genocidal tactics as in Darfur but ran longer, immobilizing the region for decades. Unlike Darfur, which still lingers under Sudan’s rule, the southerners actually won. Hiding in the countryside, they wore out the Khartoum regime, which agreed to a peace treaty in 2005. More than five years later, a massive deployment by the UN helped midwife a truly independent South Sudan, and former U.S. Secretary of State Hillary Clinton and current ambassador Susan Page both pushed hard to make the peace deal stick. In 2011, USAID and other agencies spent more than $100 million on everything from schools to refugee camps, including an impressive array of road-building projects. That’s only a quarter of the money promised by the U.S., but this year’s budget calls for $244 million, easily the largest aid package in South Sudan, and Sven’s European Union is also investing heavily in rural development and “capacity building,” the euphemism for helping the South Sudanese construct a government that isn’t corrupt. Good luck with that. President Kiir recently sent a pleading letter to his ministers asking for the return of $4 billion that he said had gone missing. Oil will be as much curse as blessing: some 75 percent of the old Sudan’s oil fields are just inside the southern territory, while the only two pipelines go north, through Khartoum to the Red Sea. Since independence, relations between Sudan and South Sudan have declined rapidly, the north withholding payments for southern oil, the south retaliating by withholding the oil itself. 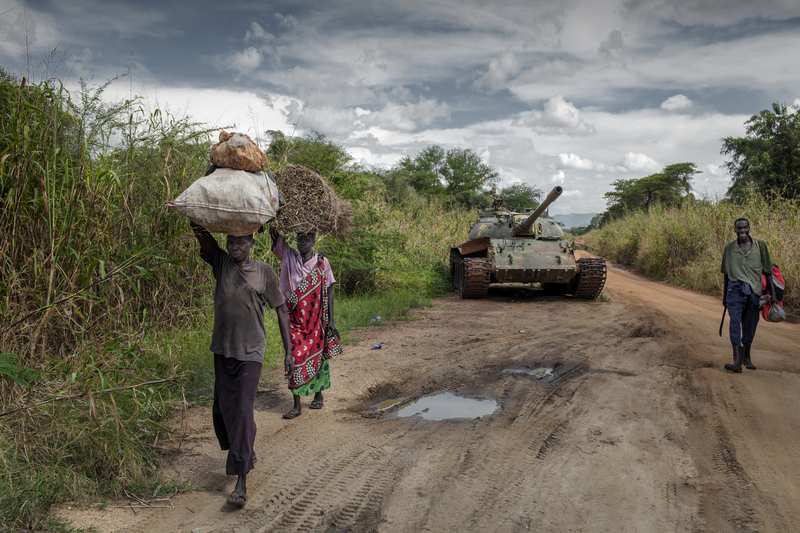 (South Sudan lost 98 percent of its government revenues; the north was hurt almost as badly.) Meanwhile, continuing outbreaks of violence have threatened to ruin everything, and despite a new deal to restart the flow of oil and cash, neither was moving during my visit in late 2012. South Sudan had the desperate, inflated feel of a wartime country dependent on charities and aid, with Chinese contractors waiting in the wings for their turn. Maybe the fighting will stop. Maybe the oil will start. But no matter what happens, almost anything will be an improvement. DAY TWO AND THE AIR is wet and warm, the voice of Africa a low rumble of water from a deep cleft. Somewhere down below the flat acacia trees, hidden in thick green bush, is Imatong Falls. South Sudan’s other great resource is water, pouring copiously out of the high southern hills toward the northern deserts. We catch only a brief glimpse of the heavy, rushing cascade along with our first peek at the steep and jagged mountains overlooking the tree-filled valleys. Then we move on without pause. Sven is setting the pace and it is fast. No time for soaking our toes or for anything but walking. The day before, in the Land Cruiser, the von Burgsdorffs engaged in what diplomats would call a frank discussion about the extent of paved roads in South Sudan. “One thousand kilometers,” Sven said. Sven began naming towns with a few paved blocks here and there. “He’s counting every sidewalk!” David shouted from the back. They could go at each other like this five times an hour, merciless, relentless, and still laughing. Sven takes pride in his son—even more in walking him into the ground and eating weirder things. If David surfs with great whites in Cape Town, Sven parachutes off a high cliff above Juba into the arms of waiting policemen (actual story). Somewhere between the dismal reality (a hundred kilometers of asphalt) and the diplomatic optimism (a thousand) is the real South Sudan, the one that matters. It was night by the time we plunged down the final miles of the road south, passing the town of Torit and arriving in a small village called Kitere at the very end of the road ruts. We woke up on the dirt floor of a hut in darkness. “The adventure starts where the road ends,” Sven offered, and nothing was a cliché at 5:40 A.M.
Once we’ve gathered a guide and a few porters from Kitere—a biblically named crew called Daniel, David, Simon, John, and Joseph—we start ascending steeply up through fields of ten-foot-tall sorghum on a muddy path no wider than a single man. Even this begins to fade quickly, and after passing a few final primitive huts and corn fields, we climb an ever narrower track, slippery clay sending us crashing down repeatedly. Sunrise makes it clear that our route to Mount Kinyeti—about 31 miles round-trip, by Sven’s calculation—will be painful. Impenetrable brush closes over the trail, which is soon reduced to a hunters’ trace used by outsiders only about once a year. Daniel says he’s brought five previous groups to the mountain since 2005. The fact is, we’re out of our league. Sven is a fitness freak and sets a pace that even the hardened Africans have trouble keeping. Back in Juba, I talked with Peter Meredith, a famed South African kayaker who is trying to launch the first commercial rafting trips in South Sudan, to take expats from the capital on floats down the White Nile. Meredith suggested doing the hike to Kinyeti in three or more days, but with Sven’s meeting in Juba, we must travel 31 miles, get up to 10,000 feet, and be back at the road in a little over 48 hours. Ferns enclose the trail, and the dramatic views of the pale green Imatongs are extinguished by triple-canopy jungle, a chaotic world of switchbacks amid stinging fireweed and stands of mint and wild cannabis. Eight hours pass this way, until we finally collapse at 7,500 feet next to a crude lean-to. We fumble into sleeping bags and tents; the disciples curl up on the ground under their jackets. GETTING ANY VIEW of South Sudan as a whole is tough. Juba is located well enough, sitting where the powerful White Nile drops out of the Central African lakes, the mother water rolling northward past the city at running speed before it splits into meanders to form the vast, 11,500-square-mile Sudd wetland, among Africa’s largest. Eventually, the waters regather, joining the Blue Nile in Sudan proper and pushing past Khartoum and on to Egypt. 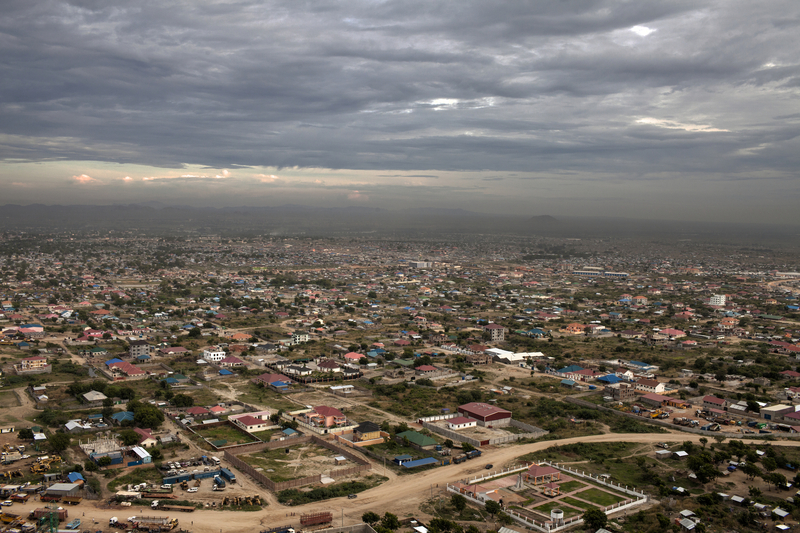 But Juba is more encampment than city, a sprawling settlement of homely huts and instant apartments whose population has swelled to more than a million as waves of returning exiles and rural people have moved in. Many thousands of foreigners have come here as well, riding around in white Land Cruisers during the twice-a-day traffic jams that are a mark of pride for locals. The most common signage is anything beginning with the letters “UN,” and a trip across town uses reference points like “Go past WHO” and “Turn left at WFP.” Diplomats from the U.S., Europe, Africa, and China have set up shop, as well as hundreds of foreign NGOs, everyone from the Red Cross and Norwegian Church Relief to War Child and—it’s all about cattle here—Veterinarians Without Borders. In a place where hotel rooms are made from empty shipping containers and everything from gasoline to rice is imported on the back of a truck from Kenya, inflation has skyrocketed: a taxi across Juba costs twice as much as in New York, hastily built apartments are priced as if in central Rome, and locals can afford nothing but asida, or corn mush. Many foreigners are sweating out their lives in the northern refugee camps, healing and organizing, but in Juba the expat tone is that of a lunar colony with pool parties and endless paperwork. In a two-story white building I meet Cirino Hiteng, one of the young country’s rotating cast of ministers and its most dashing defender of wildlife. He wears a Nairobi-style short-sleeved suit in gray, topped with a narrow-brim trilby and accessorized with a South Sudanese flag pin, a flashy watch, two rings, and a Livestrong-style yellow bracelet reading HOPE FAITH LOVE. Hiteng may look like the minister of hip-hop, but his affection for animals is deep. Hiteng is from a peasant family in Torit, near Mount Kinyeti, and he recalls walking to school (“Nine miles there, nine miles back”) to write his first letters in the sand with a stick. He got to Catholic school and eventually earned a Ph.D. in international relations from the University of Kent, in Canterbury, England. 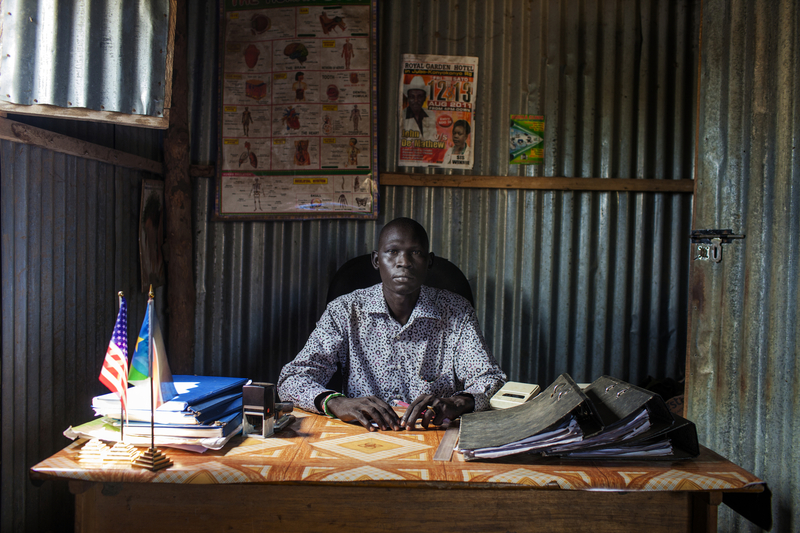 A South Sudanese with an advanced degree is a rare thing, and Hiteng has rotated through an array of posts, serving as chief of staff to the president and now minister of what is called Culture, Youth, and Sports. Still, Hiteng is well aware of South Sudan’s problems. The parks, many of them dating back to British rule, have almost no staff funding, training, equipment, or infrastructure, and animals are constantly poached for meat. Giraffes—slow moving and hard to miss—are shot first, and there are organized raids by horsemen from Sudan, who massacre elephants and carry the tusks hundreds of miles back to Omdurman, where artisans carve them and export them to China. The Chinese themselves are also here, building roads and hoping to invest, like Europeans and Americans, in the oil industry. The common denominator in all this, Hiteng concludes, is lack of infrastructure. “Roads!” he cries. “South Sudan is a huge land. It is almost impossible to travel across it.” Better roads will bring medical care and tourist dollars to the isolated tribal cultures that define both the glory and problems of South Sudan. They’ll also open up more areas to poaching and illegal logging. That afternoon I visit another minister, Gabriel Changson, the head of Wildlife Conservation and Tourism, crossing Juba on the back of a boda boda, the euphonious name for a motorcycle taxi. Changson is not as flamboyant as Hiteng—he sits calmly behind a desk the size of a lifeboat, wearing a pressed dress shirt. But, like Hiteng, he is well educated. A Nuer from near the border with Ethiopia, he has a background in banking and a master’s in economics from Duke (“Go Blue Devils!” he says). Changson doesn’t know his own age (“About 60,” he guesses), but he knows tourism will protect the animals of South Sudan. Like Hiteng, he talks about Kenyan-style eco-lodges, tent safaris, bird-watchers in the Sudd swamp, and the need to train South Sudan’s 14,000 wildlife rangers, army conscripts without equipment or skills. The country’s paper parks are roadless and so large—Boma is 8,800 square miles, and the Zefah Game Reserve, in the Sudd, is 3,700—that they can’t be patrolled. Right now nobody is coming. In two weeks I meet one tourist: a Japanese woman literally checking off a list of African countries. There is currently nothing for a tourist to do. I sign up for a safari to Boma, but it’s cancelled amid late-season rains and shifting paperwork. Meredith, the kayaker, says his hopes for a rafting business were curtailed when NGOs and embassies, out of security concerns, banned their Juba staffs from leaving the city on weekends. There are many bright spots—more than a million if you count those migrating antelope. And the WCS has been able to count thousands of elephants in South Sudan, collaring 34 with satellite transmitters and tracking them daily. But the country’s situation is changing rapidly, and for animals and ecosystems, Elkan says, “the pressures are higher,” as peace allows people to start moving around, exploiting resources. Several of those WCS-tagged elephants, in fact, have already been poached. Keeping the animals alive will depend on law and order in the countryside, schools and bore holes, tourism of the right kind, legal and regulatory advances, training for rangers, and an infrastructure of roads, lodges, and spotting planes, all within five years. Without that seismic shift, the elephants will be wiped out, the hartebeest turned into bushmeat. “It’s a fixer-upper,” Elkan says. DAY THREE turns out to be surprisingly easy, for the simple reason that Marco and I never make it up the mountain. By the end of day two, we had reached the flanks of Kinyeti, the barren summit visible just once through the thicket of vegetation. But the slopes are steep and the journalists weak. We huddle around a campfire well before first light, chilled and wet after a night on the ground. Daniel calculates that it will take the Germans four hours to ascend the last few miles, on a switchbacking trail that climbs 2,500 feet in thick forest before bursting into the clear. But Marco and I—Daniel calls us la marwani, the old men—will need five hours to summit, and that’s before the hike back out to the road. All in all, we’re looking at a 12-hour haul. While we sulk in our tents, Sven and David storm the peak. They make it up in less than four hours, Sven hauling the 30-pound paraglider himself. On the misty top, they hold out South Sudan and European Union flags in a snapping, cold wind. Too much wind: the glider stays in its pack. The von Burgsdorffs march back down and collect the shame-faced journalists for the hike out. Elapsed time: seven hours. So my cowardly day three is only this: a half-dozen miles crashing down wet trails in dense brush, leaping rock to rock, pounding up and down spurs of mountain in a frantic effort to keep Sven in sight. Patient, merciful Daniel paces me for a while at the back of the column, pointing out the dangerous fireweed, whose hairy edges sting like coals, and a vine that coagulates wounds. When we’re attacked by safari ants—stubborn black biters that crawl up inside our pant legs—he shows me how to find and kill them under the fabric. The disciples pause to scrape “honey” from a dark hole in a eucalyptus tree, actually a sweet sap loaded with crunchy insects. The forest gives up its secrets. In the late afternoon we encounter two hunters, giddy young men running in circles, frantically searching for a slim, straight tree. Using machetes, they chop down something the thickness of an arm, cut it to ten feet, and jog off into the bush, inviting us to follow. Not far away, they’ve caught a boar. The pig is in a wire snare and has raged against the jungle for hours, clawing a circle of black dirt in the exact radius of its leash. Daniel warns me to climb up onto something: “If he comes for you, he will kill you.” Indeed, I can see the animal’s three-inch incisors when it snarls. 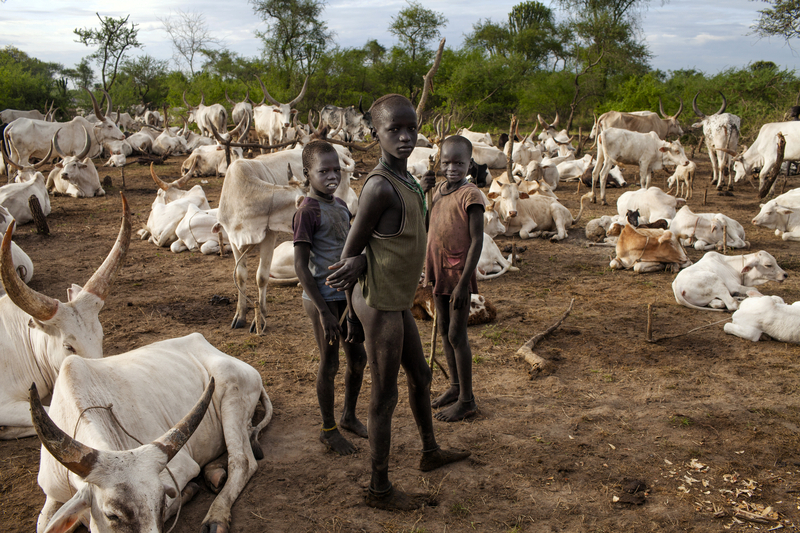 The Imatong are remote and untroubled, so this is one of the only places in South Sudan where no one carries a gun. The hunters have already fired an arrow into the pig’s throat, with no effect. Now they set about beating it to death with their ten-foot pole. The men then swiftly bleed the carcass, truss it on the same pole, and lead us up and over a forest and down into a swamp where they’ve built a smoky fire. They devour a big pot of asida as the pork cooks. Later I hear that these men are poachers, but there are no rangers, no signs, no evidence of laws and rules, only hungry men of the bush crawling forward. We move uphill onto dry ground in the last moments of light and pitch our tents under magnificent, ash-white eucalyptus, which climb 200 feet or more into the air. You don’t normally see tall trees like these in South Sudan, but here is more evidence of what war has preserved. The trees grow in perfect rows—the area was a British plantation at the time of Sudan’s independence in 1956 but has been neglected ever since. Sven is looking everywhere for the future. Around the fire he outlines development ideas. There’s potential for an eco-lodge at Imatong Falls. And down in Daniel’s village, Kitere, they could form a cooperative and harvest some of these trees to pay for schools or farming equipment. Eventually they might start a sawmill, like in the old days, and have a small, sustainable business. All it will take is clearing the old British logging road, which is blocked with dead trees but otherwise in fine shape. “Why don’t you clear the road?” he asks Daniel. “The problem is the government,” Daniel answers. The wind sweeps the high branches back and forth, flakes of papery bark raining down on us like snow. We make it out in the morning, hopping all the streams again at double speed, busting our humps to make it back to Juba on time. But then the Land Cruiser breaks down. After all that, Sven has to miss his meeting. He takes it well, sitting in the hot shade of Torit all afternoon, drinking tea, finally at rest. LIKE THE GREAT migrations and towering eucalyptus, South Sudan’s human cultures have endured because war immobilized the country decade after decade, paralyzing progress. Questions about the survival of animals and habitat are not separate from the survival of man himself, and tribes here have persisted to a surprising degree, especially in the country’s cattle camps. 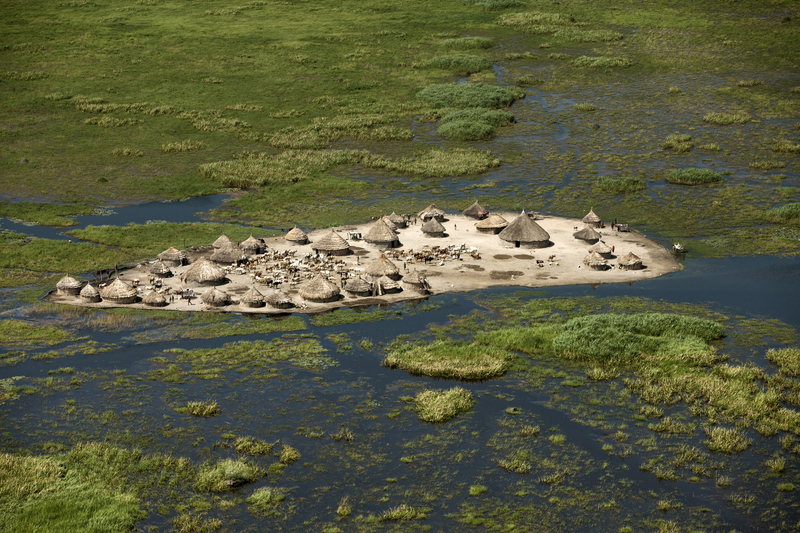 These laagers, island-like villages that appear like beaten-down brown circles in the immense green of the savanna, form wherever seminomadic groups settle to let their cows graze. In Juba, Marco and I hire a car and driver ($500 a day) and head north before dawn, hoping to find such a camp. After only an hour of bad-road driving, we spot a herd of Watusi cows, white beasts with great curved horns, scattered in the bush. A few hundred yards of walking brings us to a cattle camp, a dozen half-naked men and women gathered beside a smoldering dung fire. They’re Mundari, native to this region and known by the ash smeared on their bodies and the three V’s of ritual scarring across their foreheads. They greet us with indifference (mostly) and wild threats (the largest man). A towering, ash-covered warrior wearing only a blanket, he immediately challenges me to a fight, but then calms down and allows us to settle in around the fire. The Mundari have blankets, a few plastic sheets for sheltering infants against the rain, and wooden goads, the short prods used to move cows. There are two cell phones in the camp, neither working. A couple of immensely tall women sit on blankets, steadily shaking gourds back and forth, churning the milk of the cows into a fermented, alcohol-like drink. Cattle are bank account and social status—a hedge against hunger, an investment, and the key to getting married. (With some tribes, paying a dowry in cattle has become a human-rights concern, as girls as young as 12 are traded as child brides.) Cattle raids—organized stealing expeditions—are endorsed by both culture and economics here. In 2011, more than 1,000 people were killed during a cattle war between the Nuer and Murle, on the outskirts of Boma National Park. A hundred thousand cows were stolen, along with hundreds of women and children. The men paint my face with dung ash, roaring with laughter at the result. Then Marco and I head off, passing a town—a few roadside kiosks selling gasoline in soda bottles alongside an empty refugee camp—before moving deeper into nothing. During a pee break, I’m zipping up by the roadside when three naked men walk out of the tall grass. They aren’t here to herd cattle. Their scarring is Mundari, but they carry burnished cow-leather shields and carved fighting sticks, not normal goads. Their skinny, hard bodies are naked and oiled, as if for a wrestling match, but they’re in a good mood. We stare at each other for a while until we are interrupted by a tense hiss. They fall quiet, squinting. I follow their gaze back down the road. Another file of men, also naked, also prepared for fighting, has appeared in the distance. Our guys wave a pennant in the air, a colorful homemade flag, and their guys break into song, jogging quickly forward. Moments later, all the men embrace and laugh. In the middle of the dirt road—it’s not like there’s any traffic—they break into new songs and put on a display of stick fighting, blows rattling the shields, their shiny bodies staging scenes straight from an Attic vase. The driver—a Ugandan—cowers in the car, saying, “I have never seen anything like this in my whole life!” If you want a romantic encounter with ancient Africa and don’t mind land mines, South Sudan is the place. ON THE LAST DAY of my trip, rising for another East African dawn, I meet Paul Elkan at the WCS’s little compound near the airport. In the past seven years, Elkan has logged more than 1,000 hours flying over the plains of South Sudan, many of them with National Geographic’s Mike Fay, and has seen a genocidal civil war turn into a cold peace. Like many NGOs, the WCS is trying to build something from nothing, scraping together training programs and keeping two airplanes aloft. After some puttering around with the Cessna, the motor finally catches, and we’re off to see the biggest secret in South Sudan. First, however, a charity traffic jam. In an almost roadless country, air transport is king, and there are more than 60 planes parked at the airport, mostly small grasshoppers from the UN, NGOs, and missionary groups. We taxi toward the runway but are edged out by an Ilyushin 76, a container ship to our rowboat. Elkan has to hold back the throttle as the cargo plane—marked WORLD FOOD PROGRAM—idles on the runway. “Juba Tango Charley,” Elkan calls, hoping to nip in ahead of the jet, “holding short and ready.” But there’s no answer from the tower, and after five minutes the Ilyushin finally lumbers into the sky with a reek of jet fuel and a searing roar that could jump-start a migration. Well, I can’t say where he heads. For another hour he follows a GPS signal toward a part of South Sudan that is seldom seen, one more vast wilderness in this land of empty spaces. The location is secret because of what is there: one of the last great elephant stands in East Africa. To poachers, every elephant herd is simply a collection of millions of dollars of ivory waiting to be shipped to China. Two hours out from Juba, we drop back down to 300 feet. The grass shows patterns again, not the tiny depressions left by passing antelope but dark, wet zigs and zags, diamond patterns gathering tighter, trails crossing trails. We probably could have found this herd just by looking for those shapes in the grass, but Elkan is running down the satellite trackers and knows they were, yesterday at least, just ahead of us. The grass turns to a beaten black mat, crushed flat in the bright sun, and then, against a splash of water, there are elephants. Ten. Then 20. Then 50. Then hundreds. That’s just one particular herd. There are thousands of elephants out here, beyond the reach of poachers, another secret of this hidden-in-plain-sight land. Here’s hoping some things are never found. 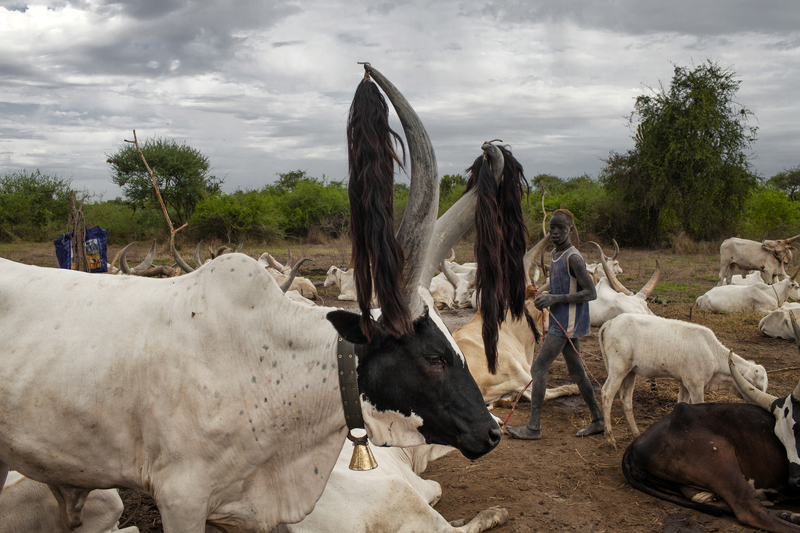 Cattlemen from the Mundari tribe are seen in a cattle camp on the road thirty-eight kilometers North of Juba. 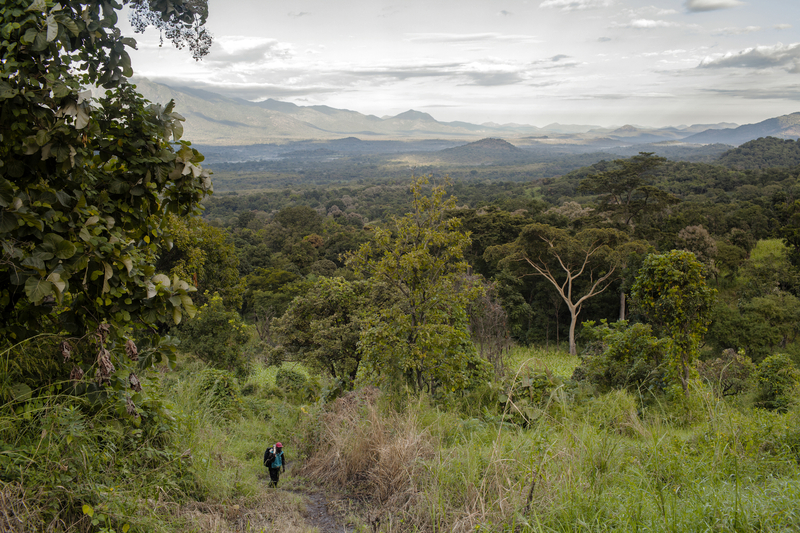 A South Sudanese man follows a path across the forest of Mount Kinyeti. South Sudanese villagers pass by the remains of a destroyed tank left after the Sudanese civil war on the road from Juba to Torit. 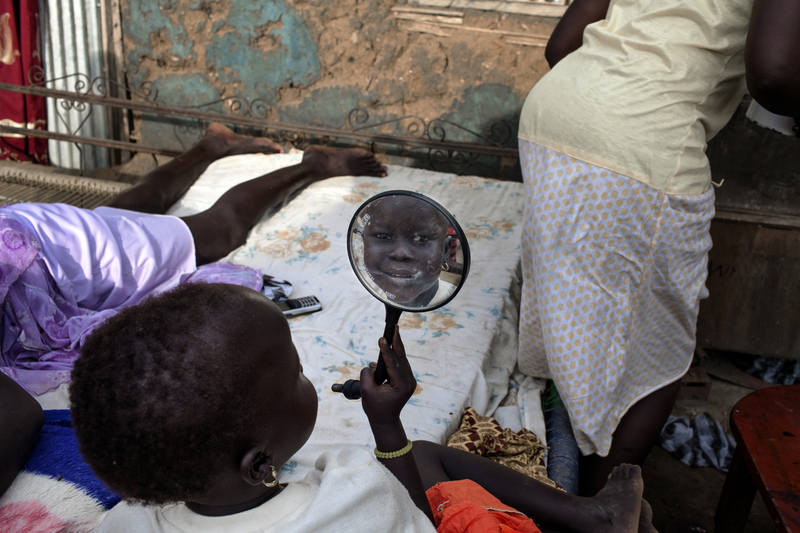 A South Sudanese girl looks at herself in a mirror in front of her hut on the Nile river bank. 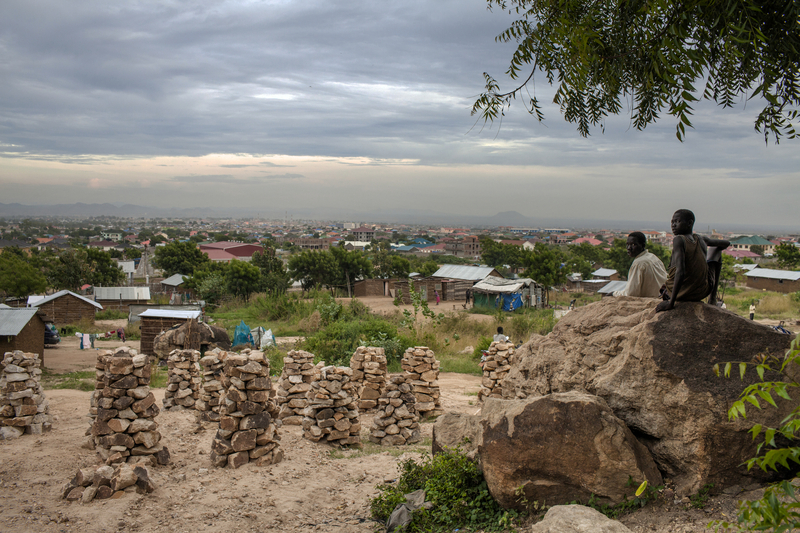 South Sudanese teenagers sit next to a stone quarry on the Jebel Kujur hill overlooking Juba. 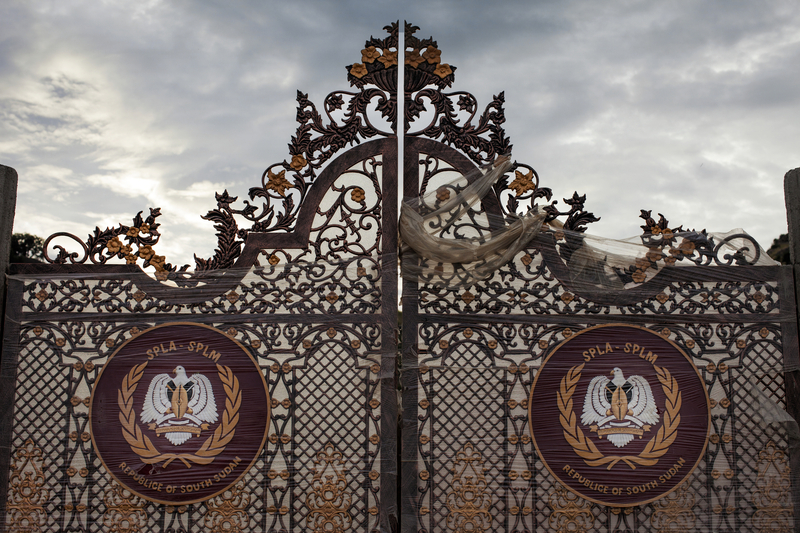 The gate leading into a monument commemorating the officers and one common soldier killed with John Garang in his helicopter crash, seen in Juba. 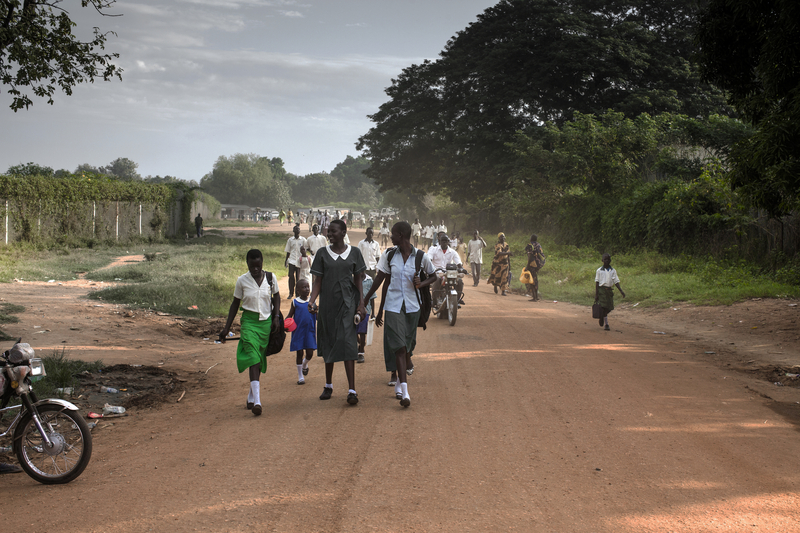 South Sudanese girls walk to school. A South Sudanese woman follows a path through the forest of Mount Kinyeti carrying some cassava. 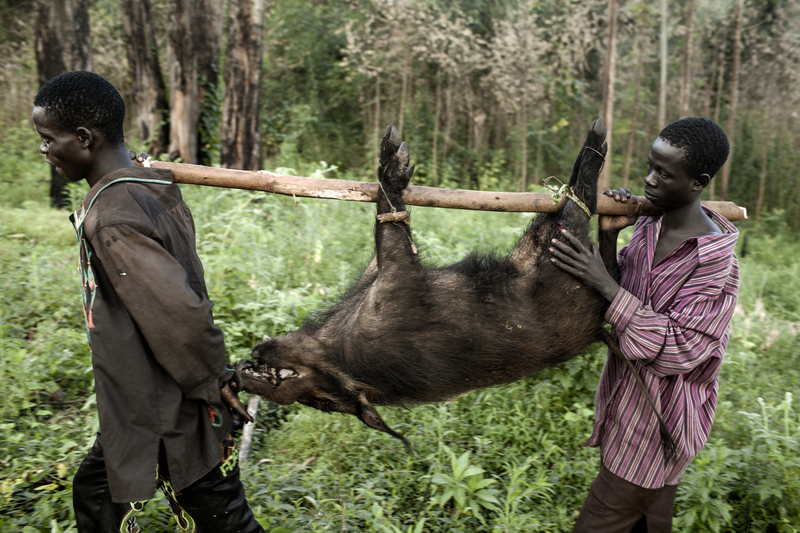 South Sudanese hunters carry a wild boar in the forest of Mount Kinyeti. 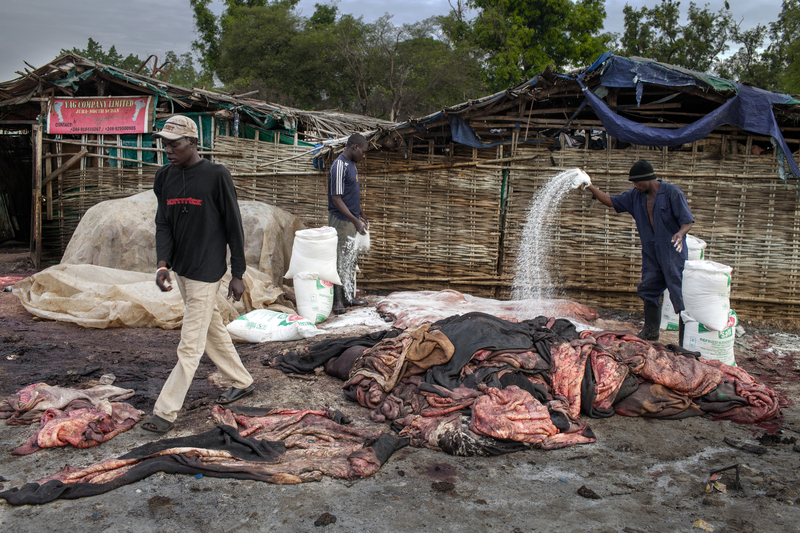 Cattle hides are covered with salt at the Juba market. 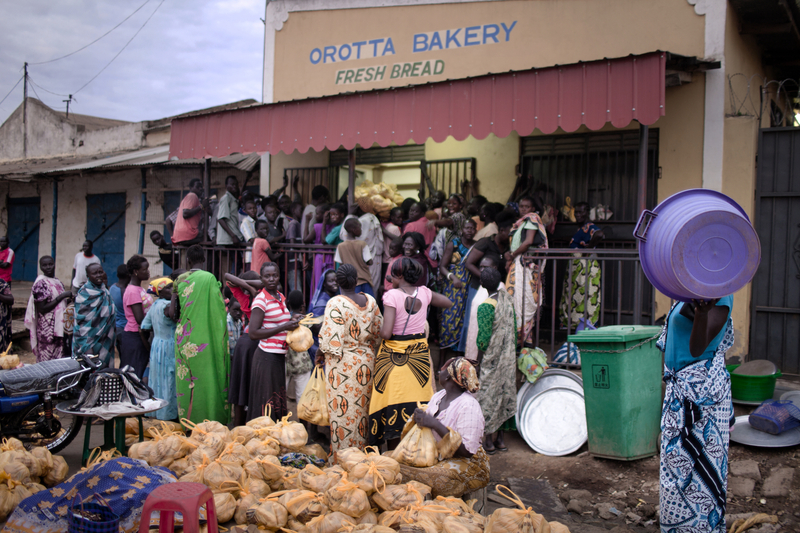 South Sudanese women are seen waiting in line to buy bread at a bakery. 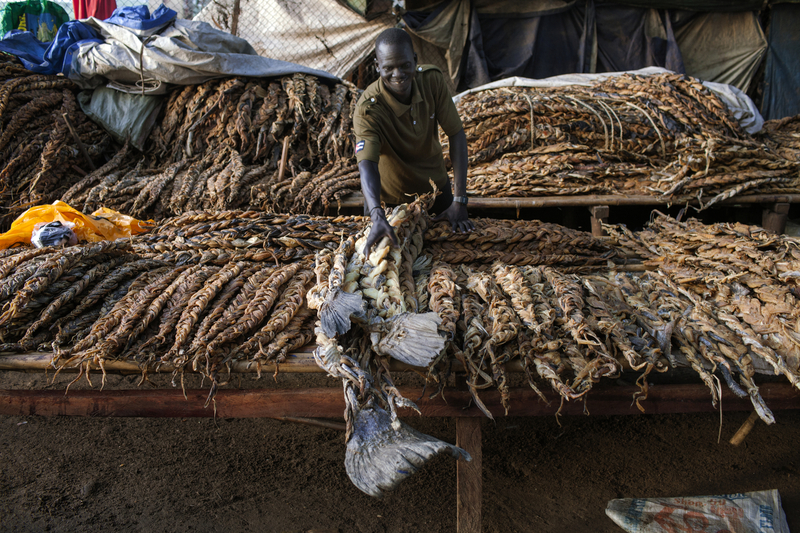 A South Sudanese sells dry fish at a market on the Nile river bank. 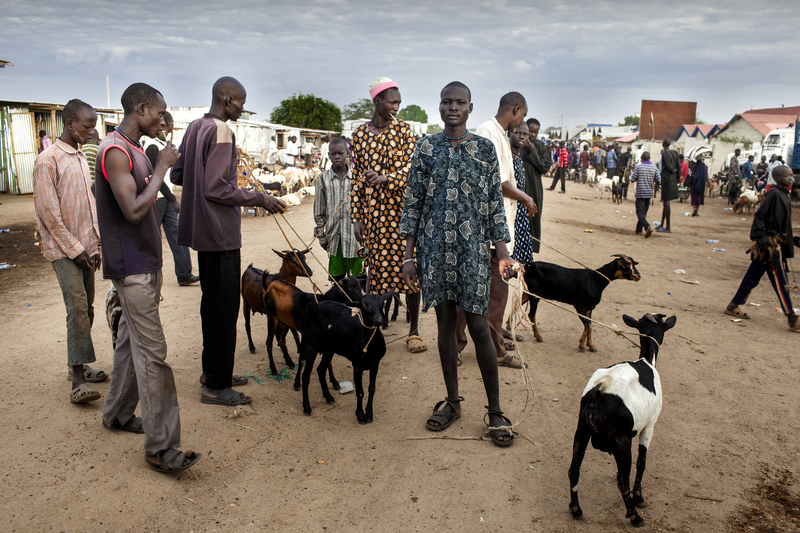 Cattle dealers are seen at the Juba market. Juba from the Jebel Kujur hill. A cattleman from the Mundari tribe rubs ash on his face to protect himself from insects in a cattle camp on the road thirty-eight kilometers North of Juba. 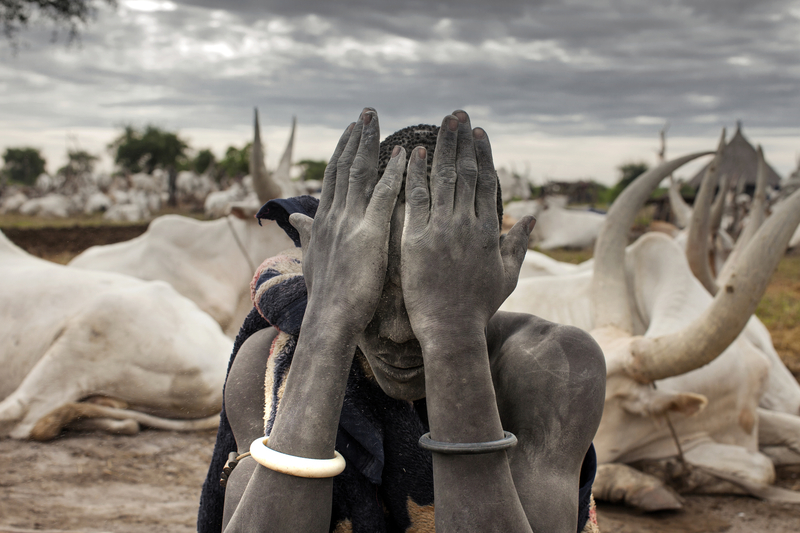 Cattleman from the Mundari tribe is seen in a cattle camp on the road thirty-eight kilometers North of Juba. Warriors from the Mundari tribe are seen on the road thirty-eight kilometers North of Juba. A general view of a village in the Sudd wetland, from an airplane. 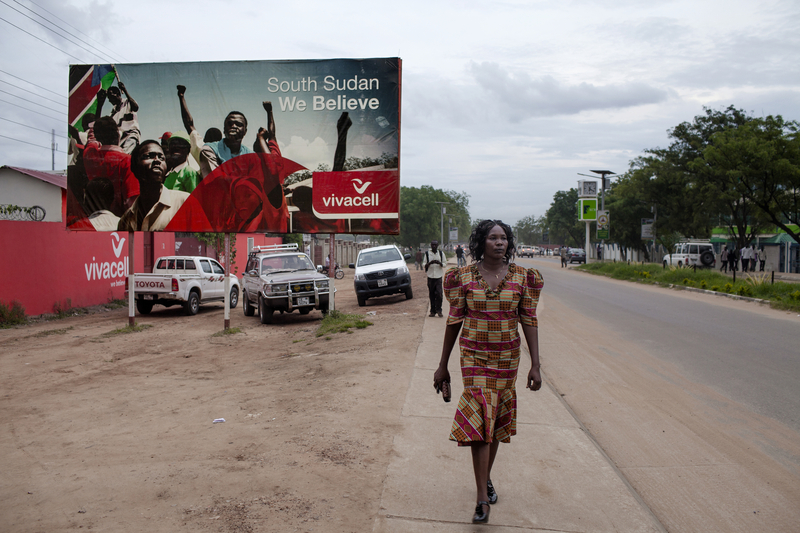 A South Sudanese woman passes by a billboard, advertising the local mobile company, that reads ” South Sudan, we believe”. 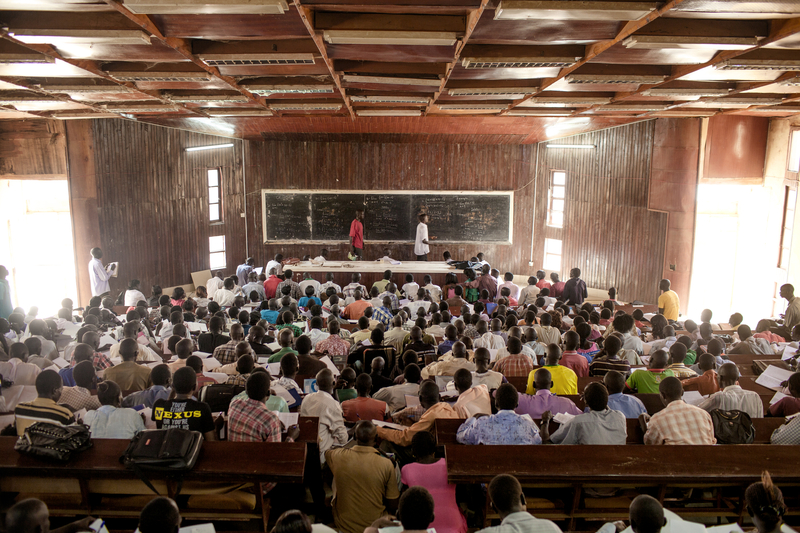 South Sudanese students are seen attending class at the Juba University Campus. 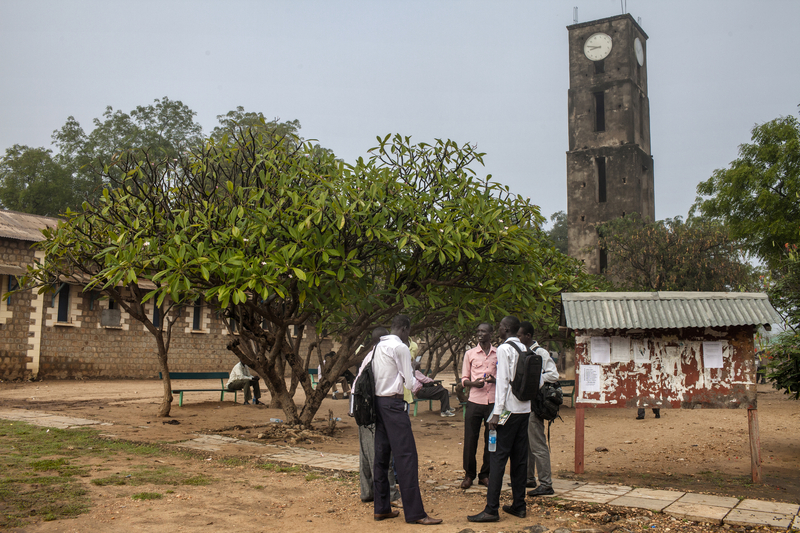 South Sudanese students are seen at the Juba University Campus. A South Sudanese official is seen in his makeshift office in charge of customs at the main bridge crossing the Nile river on the outskirts of the capital. 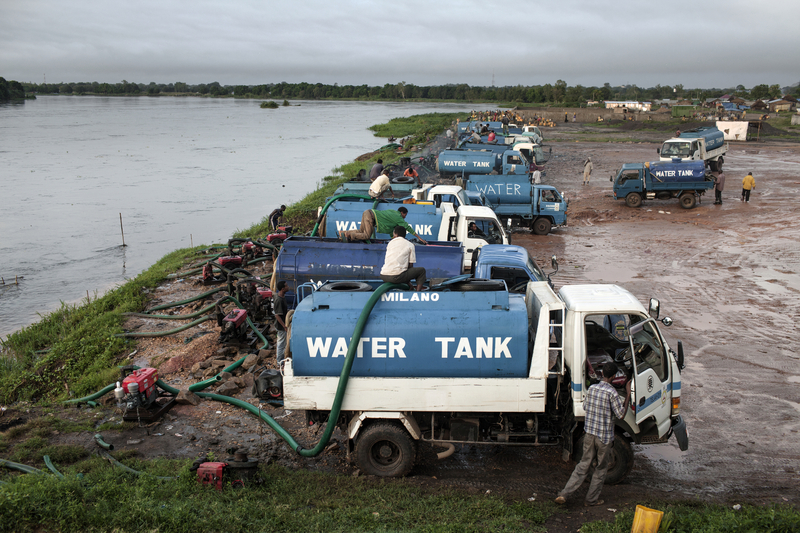 South Sudanese villagers fill a water tanker on the Nile river bank, to be sold downtown. 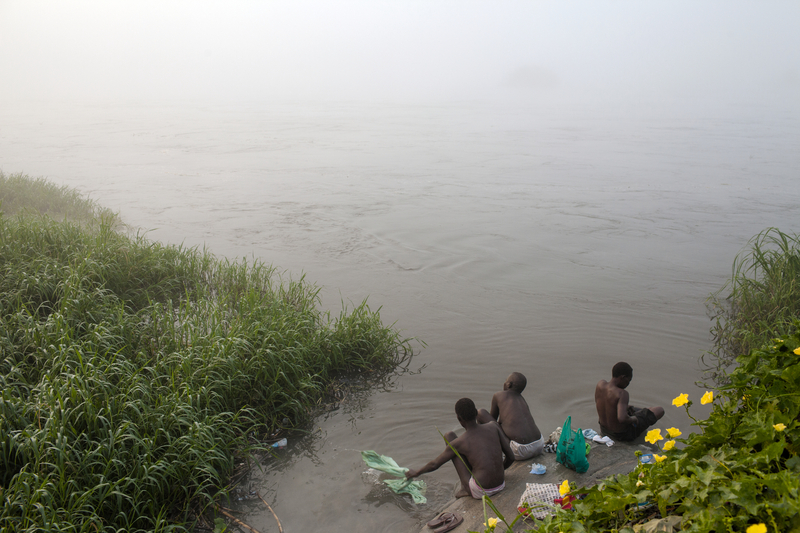 South Sudanese villagers wash themselves on the Nile river bank. 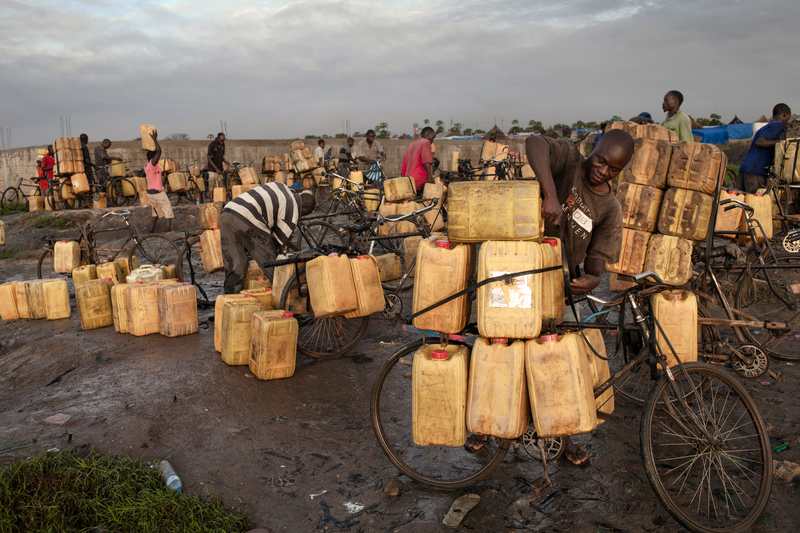 South Sudanese villagers collect water on the Nile river bank to be sold downtown. South Sudanese men wash themselves on the Nile river bank.